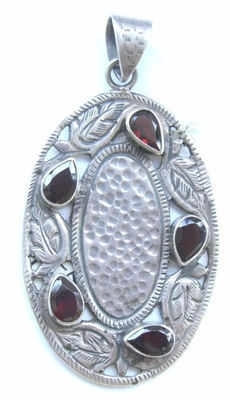 Gorgeous cherry red garnet stones on silver plaque makes up this super eye catching pendant. There are 5 stones in a lovely teardrop shape arranged around a silver plaque which has been crafted with a leaf design in between each stone and an indented pattern in the middle. Garnets measure approx 8mm in length and the pendant has is 2ins in length and 1.5 ins at the widest.